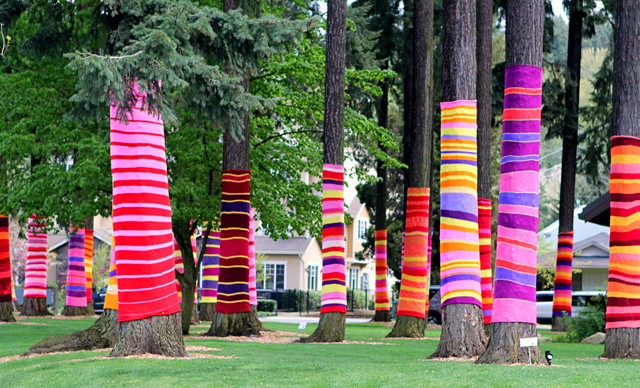 Envision Jefferson County bursting with unexpected color as Tomorrow’s Hope, area Art Alliances and community organizations along with volunteer artisans yarn bomb their communities. For more information on how you can get involved with this great activity, check the Yarn Extravaganza tab on this website or go to www.tomorrowshope.org. The Arts Alliance of Greater Jefferson is seeking exhibitors of original arts and crafts for its annual Art Walk in downtown Jefferson on July 25th, 2015 from 10:00am-4:00pm. This is an opportunity to show and sell your artwork at a local downtown business location or a vacant storefront during the event. The Art Walk is open to all artists. There is no entry or booth fee. Musicians and performers are encouraged to apply along with artists from a wide range of artistic practices. The call is open but may be limited based on the number of artists applying and businesses participating. New this year are a variety of purchase awards that will be presented to participating artists. More details will be available on the Annual Art Walk tab in coming months. Applications are available on the Annual Art Walk tab on this site.